FC Barcelona B will be playing Division 2B football next season. With one game still to play, relegation has been confirmed after they could only draw, 0-0, at fellow strugglers Albacete – who are now four unassailable points clear of the blaugrana. But it was results elsewhere that truly condemned the reserves. Gimnàstic Tarragona won away to the already promoted Huesca. Cultural Leonesa stunned playoff hopefuls Oviedo. And when news came through that Cordoba had snatched last-minute victory at Reus - that was it. Those three scores combined mean that nothing Barça B do in their final game will be enough. For much of Sunday’s game, Garcia Pimienta’s side looked comfortable and in control. Towards the end of the first half, an impressive Carles Aleñá was constantly causing trouble to no avail, and Barça looked to have finally broken the deadlock on the hour mark, but Marc Cardona’s shot hit the bar. 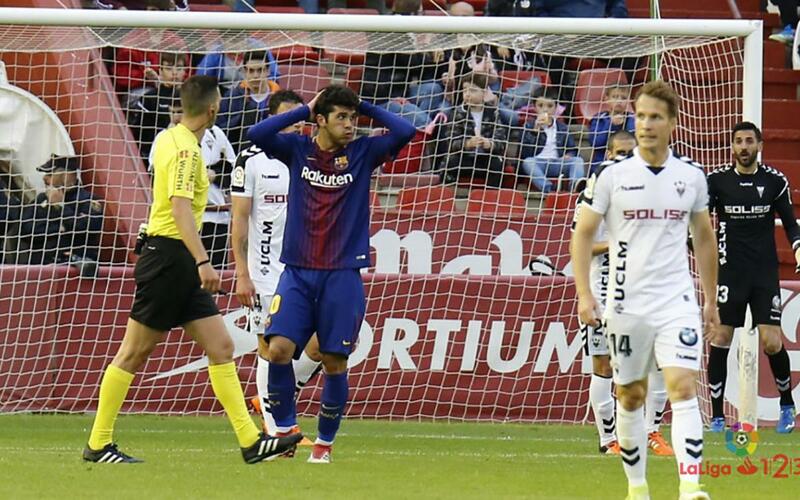 As the game drew to a close, Albacete started creating considerably more danger, and from dominating earlier on, Barça B ended up fighting to hold onto the draw. But a point ultimately wouldn’t be enough. The sides Barça were chasing all collected three, and they will now only be playing for pride when they entertain Real Zaragoza at the Miniestadi next weekend.